The Ghastly Awards Add 3 New Categories for 2014! We have added 3 NEW CATEGORIES for 2014! We are proud to announce that we are adding in 3 New Categories for 2014: Cover Art, Short Story in an Anthology and the Normanton Award. Cover Art: If you submit a book your cover will be considered. However you may also submit your Variant Covers to be considered as well. As long as it came out in 2014 it counts. Short Story in an Anthology: All stories contained in an Anthology will now also be considered for their own award. You may submit your short story without submitting the entire Anthology. 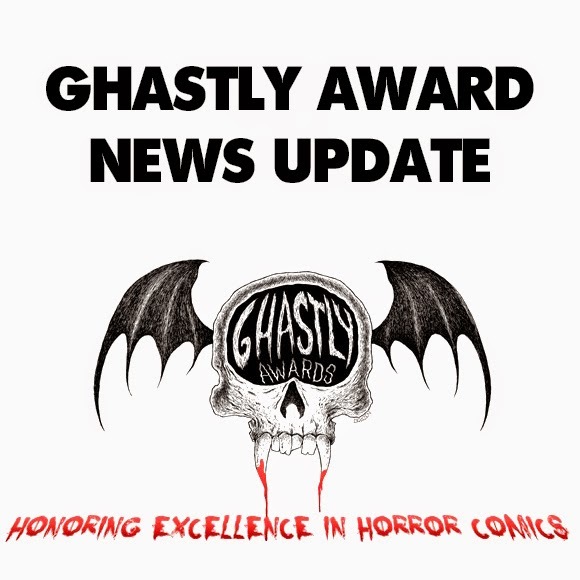 Normanton Award: The Ghastly Award Hall of Fame is now inducting those individuals who go above and beyond to make sure that the legacy of Horror Comics is not lost. The Award is named after its first Honoree, Peter Normanton. Best New Series Category Removed: The Ghastly Award Judges have decided to remove the Best New Series Category. It is difficult to tell if a book will be an ongoing or end up just being a Maxi series. So we felt it was best to remove this category and introduce the Cover Art Category.